Yellow-Naped Amazon Parrot Personality, Food & Care – Pet Birds by Lafeber Co.
Their outgoing personalities make yellow-naped Amazons one of the more popular Amazon species. Yellow napes can be talkative and gravitate toward toys that challenge them both physically and mentally. They also enjoy plenty of interaction with their people. The yellow-naped Amazon is one of the most commonly kept Amazons due to its renowned talking ability and wide spread availability. They are popular pets, but, like any bird, have their quirks and idiosyncrasies — important things to consider when looking for a long-lived pet, like an Amazon. The yellow-naped Amazon is a stout green bird with a black beak and a characteristic bright yellow patch on its nape (the back of its neck). It may have a few tiny yellow feathers on the head or around the neck, but for the most part this bird is a shimmering green. The tail is short with a band of reddish and dark green across the middle of the underside. They are good flyers in the wild, but Amazons tend to get sluggish and fat in captivity — they have prominent breasts that will get even larger as they get lazier! There is a blue mutation with a white spot on the nap instead of yellow — this bird is the color of the bluest summer sky, a breathtaking sight — and you can own one for only $30,000 — they are very rare! The yellow-naped Amazon (Amazona ochrocephala auropalliata) originates from Southern Mexico and Central America. All Amazons have a tendency toward becoming couch potatoes, sitting around all day, eating starchy foods. But there are consequences for an obese bird: fatty tumors and a greatly reduced life span. Yellow-napes are reported as living up to 90 years, so this bird is a lifetime investment — make sure that your children or a good-natured neighbor love the bird too because they just might inherit him. Good nutrition, including lots of fruit and vegetables, and lots of playtime and exercise will keep your Amazon in good shape for a long time. Lafeber’s Amazon parrot foods offer nutritional balance and opportunities for foraging. 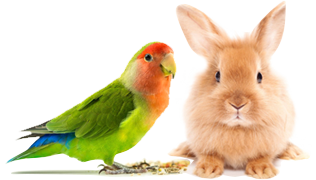 Check out Nutri-Berries, Avi-Cakes, Parrot Pellets, and more. Yellow-naped Amazons are wonderful as young birds, but tend to become nippy, even outright aggressive as they get older, particularly the males, though individual birds vary. They are notorious for temperament changes, and will attack their owners viciously. Females tend to remain sweeter, so you might want to consider a hen when making your purchase. This may not be a bird for children, as a bite from a yellow nape’s beak is formidable. But don’t let this daunt you — they have wonderful pet potential, and they are certainly a popular choice for many reasons. If you notice a temperament change, simply take precautions that you don’t get hurt, or hurt the bird either. While they are not the noisiest of the Amazons, yellow napes do have their moments — they use their parrot-voices intermittently, but they are loud! Yellow-napes are prized for talking ability, and will not be out-talked by any other Amazon, both in quantity and clarity of speech. Like many other parrots, it is uncanny what they say and at what times — they seem to be able to contextualize human speech. It has been proven that parrots are capable of this, the yellow-naped Amazon being no exception. Beware of what you say around this bird — you will be hearing it back for a long time. Yellow-naped Amazons are typically available in avian-specialty stores and from bird breeders. They are also available for adoption from an avian rescue organization. If you are adopting an Amazon parrot, be sure to ask why the bird was given up for adoption and if it has any behavioral issues.